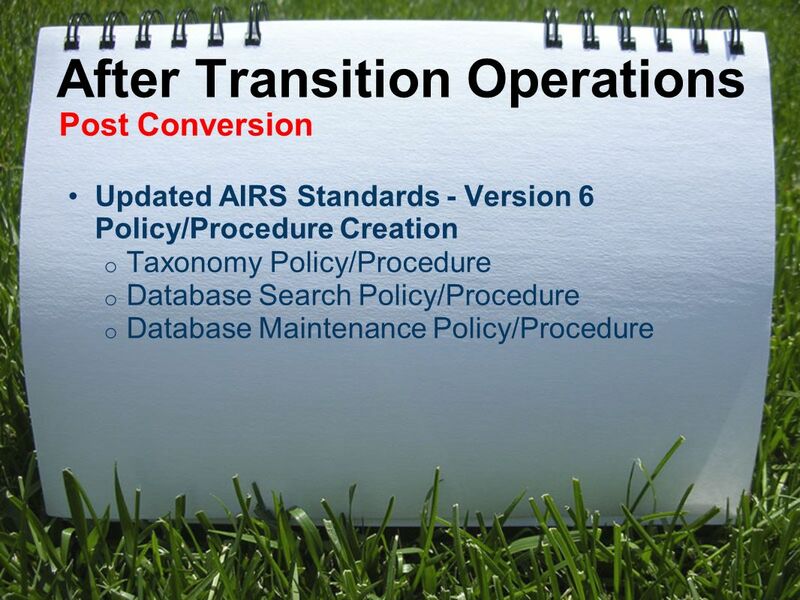 Alliance of Information and Referral Systems (AIRS) 2009 Conference PRESENTATION Transitioning from Keywords to Taxonomy in your Resource Department and. 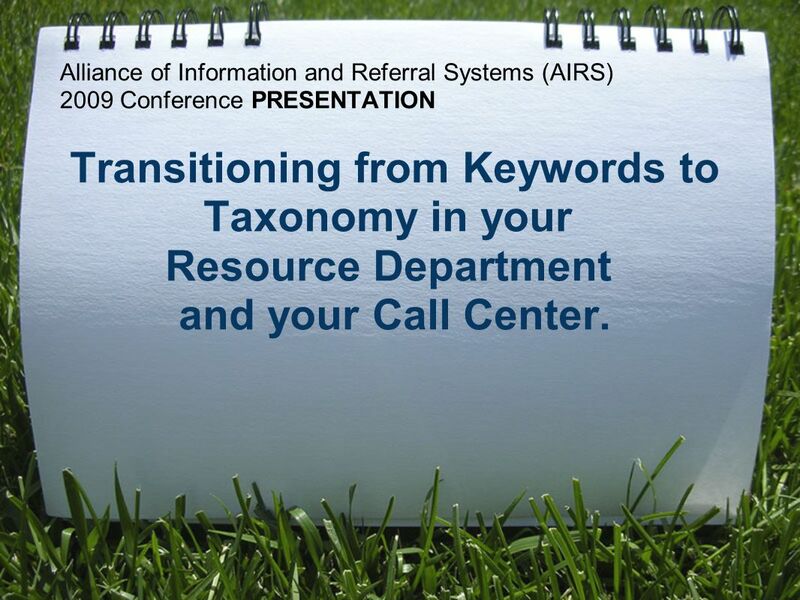 1 Alliance of Information and Referral Systems (AIRS) 2009 Conference PRESENTATION Transitioning from Keywords to Taxonomy in your Resource Department and your Call Center. 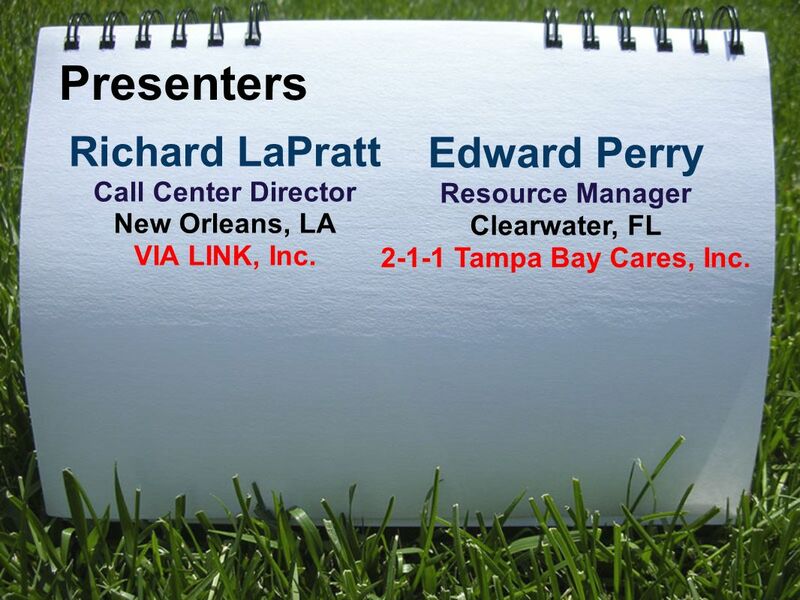 2 Richard LaPratt Call Center Director New Orleans, LA VIA LINK, Inc. Presenters Edward Perry Resource Manager Clearwater, FL 2-1-1 Tampa Bay Cares, Inc.
3 Disclaimer Today's Presentation is merely an opportunity to share our experience moving from keywords to taxonomy. 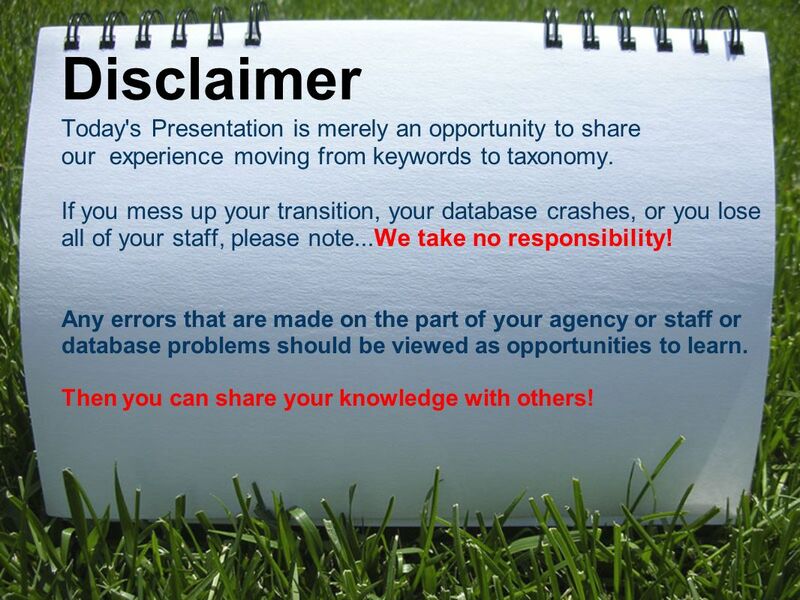 If you mess up your transition, your database crashes, or you lose all of your staff, please note...We take no responsibility! Any errors that are made on the part of your agency or staff or database problems should be viewed as opportunities to learn. Then you can share your knowledge with others! 4 We will not... 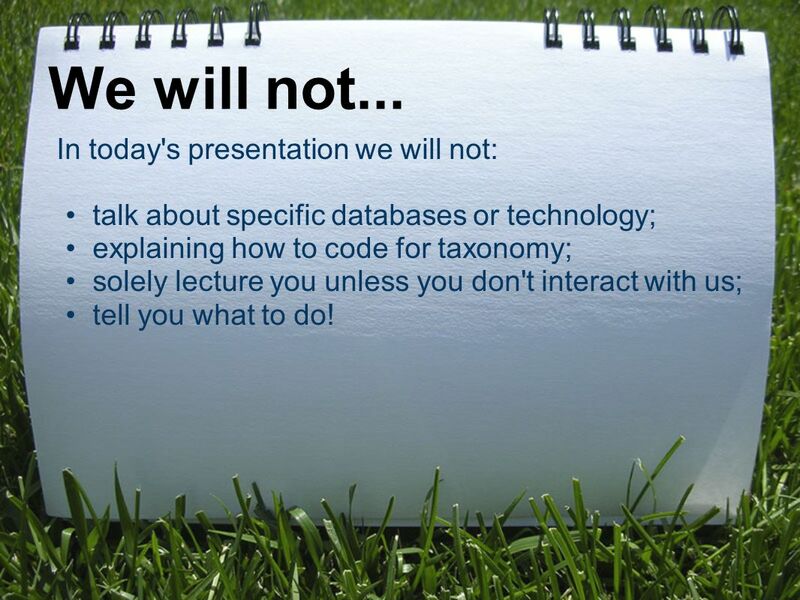 In today's presentation we will not: talk about specific databases or technology; explaining how to code for taxonomy; solely lecture you unless you don't interact with us; tell you what to do! 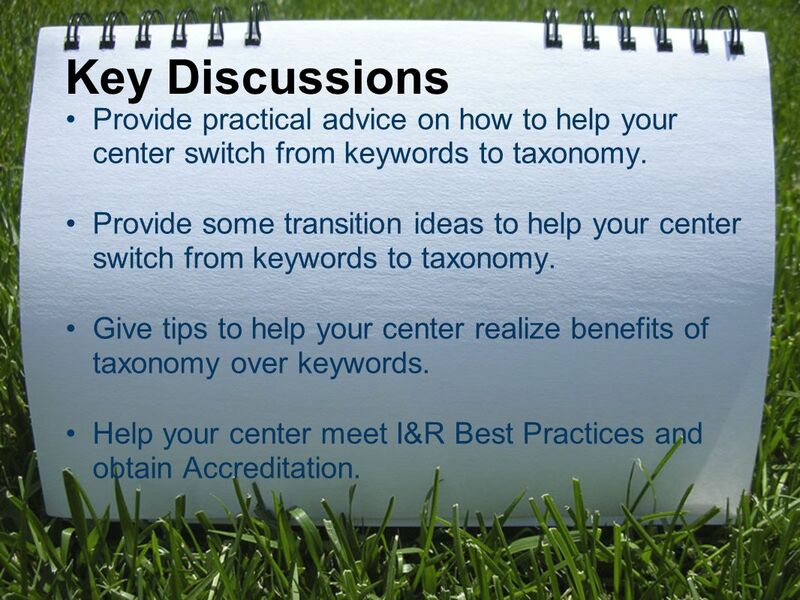 8 Key Discussions Provide practical advice on how to help your center switch from keywords to taxonomy. 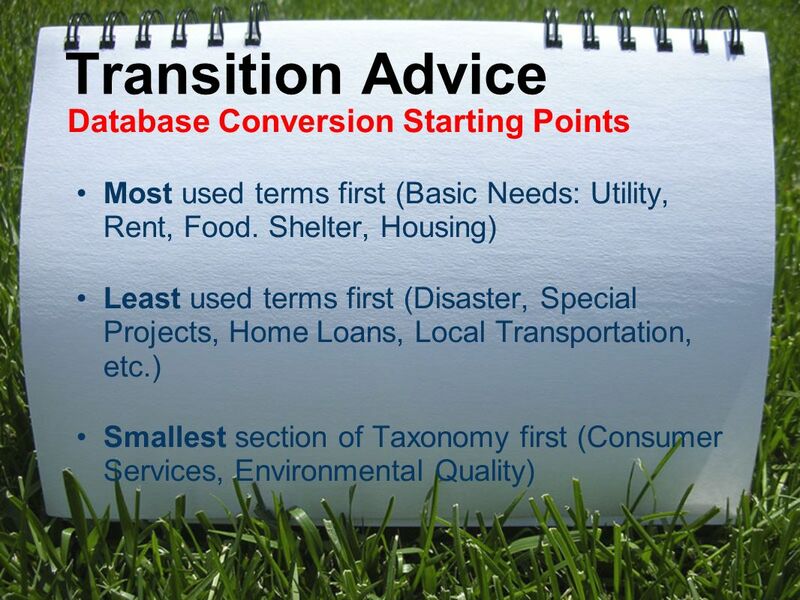 Provide some transition ideas to help your center switch from keywords to taxonomy. 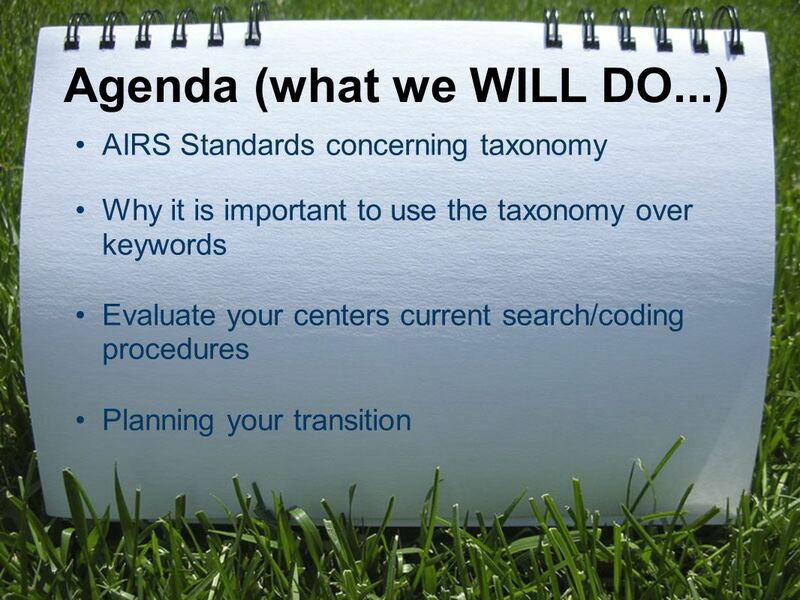 Give tips to help your center realize benefits of taxonomy over keywords. 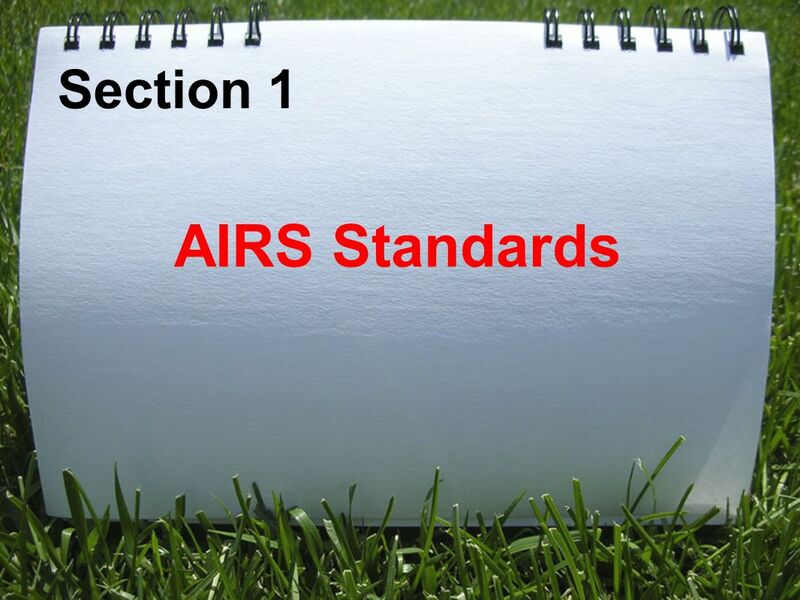 Help your center meet I&R Best Practices and obtain Accreditation. 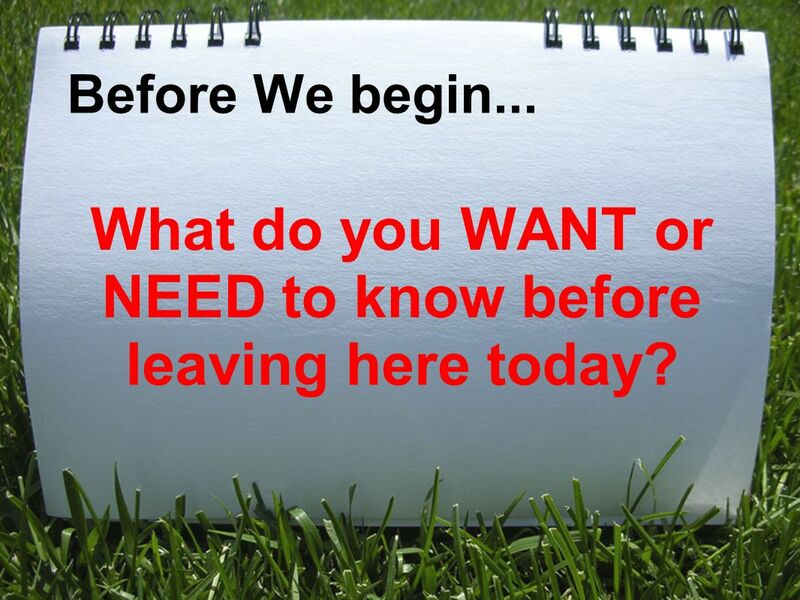 9 Before We begin... What do you WANT or NEED to know before leaving here today? 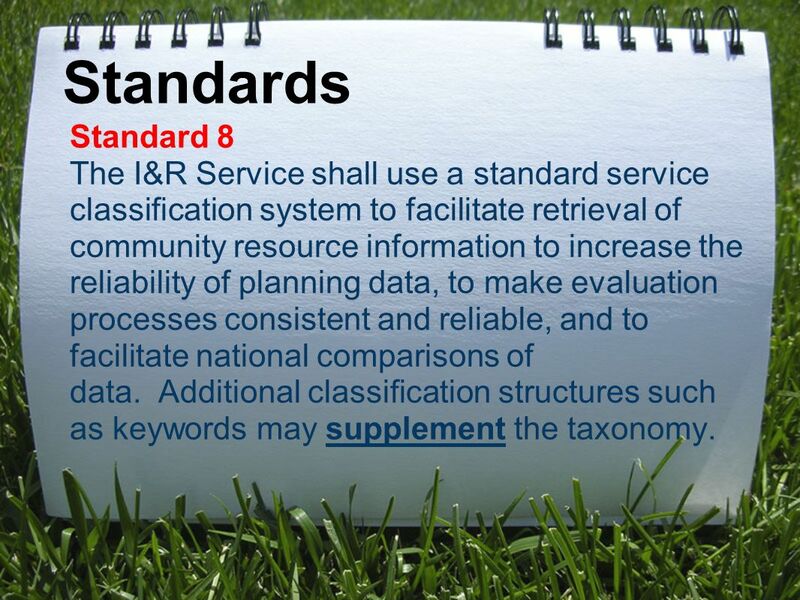 11 Standards Standard 8 The I&R Service shall use a standard service classification system to facilitate retrieval of community resource information to increase the reliability of planning data, to make evaluation processes consistent and reliable, and to facilitate national comparisons of data. Additional classification structures such as keywords may supplement the taxonomy. 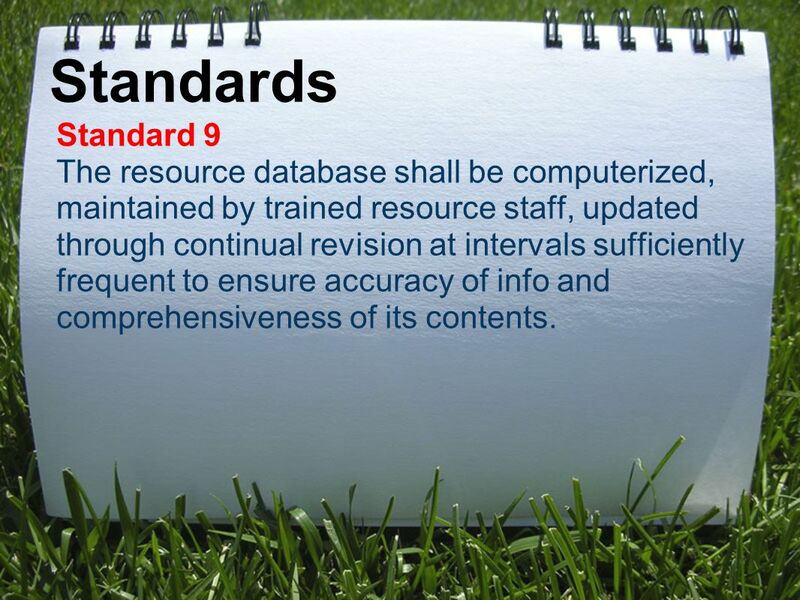 12 Standards Standard 9 The resource database shall be computerized, maintained by trained resource staff, updated through continual revision at intervals sufficiently frequent to ensure accuracy of info and comprehensiveness of its contents. 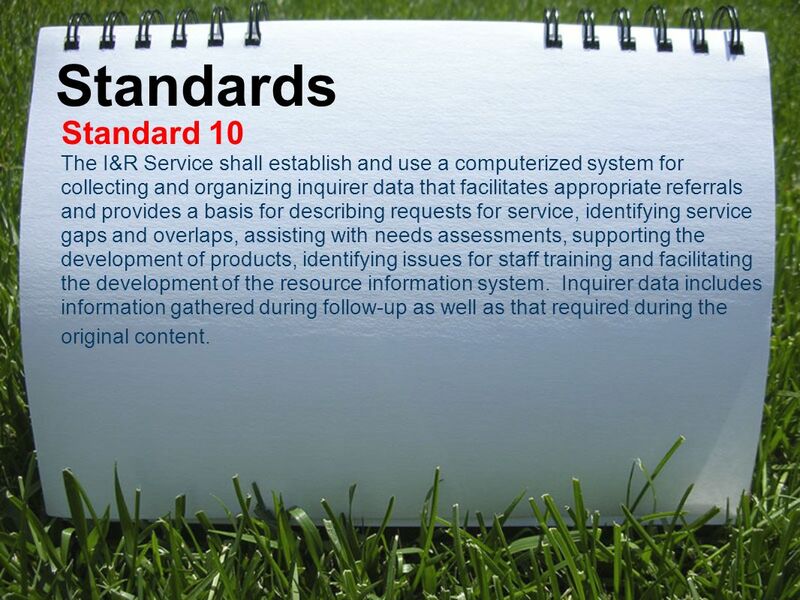 13 Standards Standard 10 The I&R Service shall establish and use a computerized system for collecting and organizing inquirer data that facilitates appropriate referrals and provides a basis for describing requests for service, identifying service gaps and overlaps, assisting with needs assessments, supporting the development of products, identifying issues for staff training and facilitating the development of the resource information system. Inquirer data includes information gathered during follow-up as well as that required during the original content. 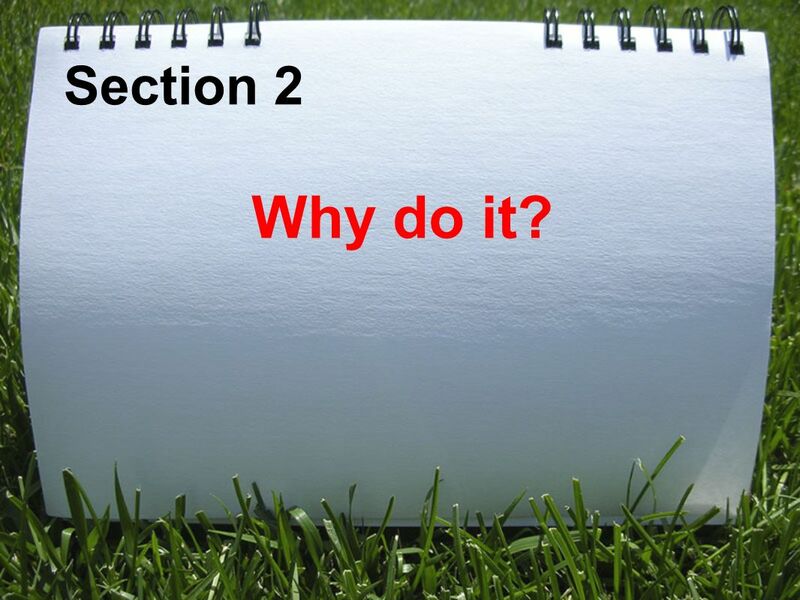 14 Section 2 Why do it? 15 Because AIRS said so... It's a National Best Practice! Uniformed National Code Set. o Used across country with all I&R services; o Clearly defined terms; o Codes maintained for each I&R center nationally. 16 Why do it? Simplifies coding for your resources. 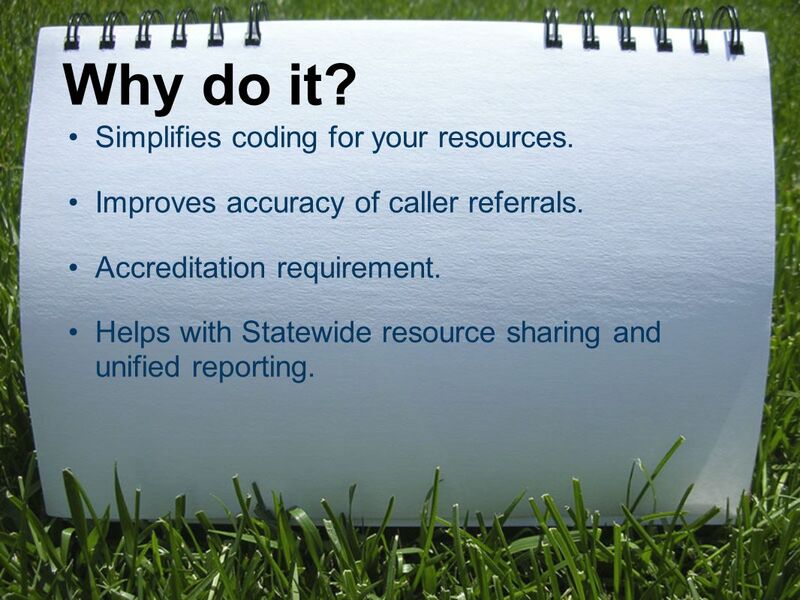 Improves accuracy of caller referrals. Accreditation requirement. 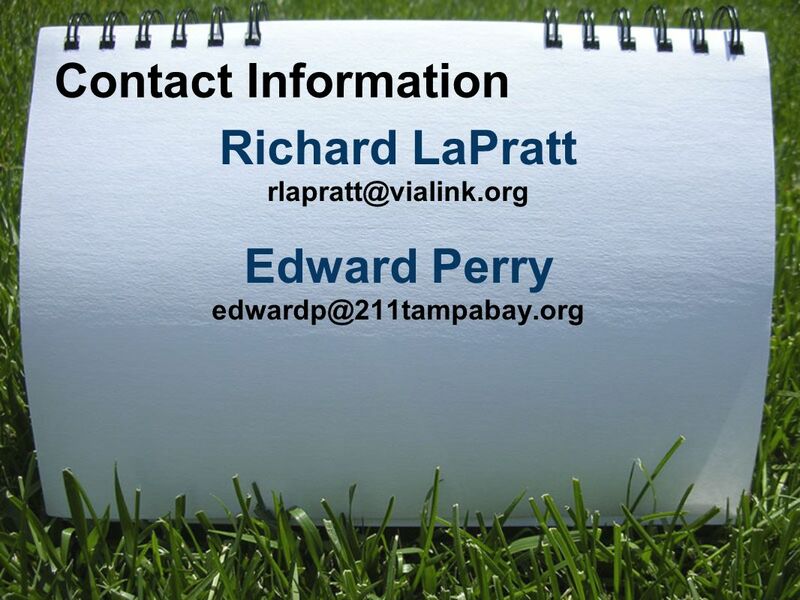 Helps with Statewide resource sharing and unified reporting. 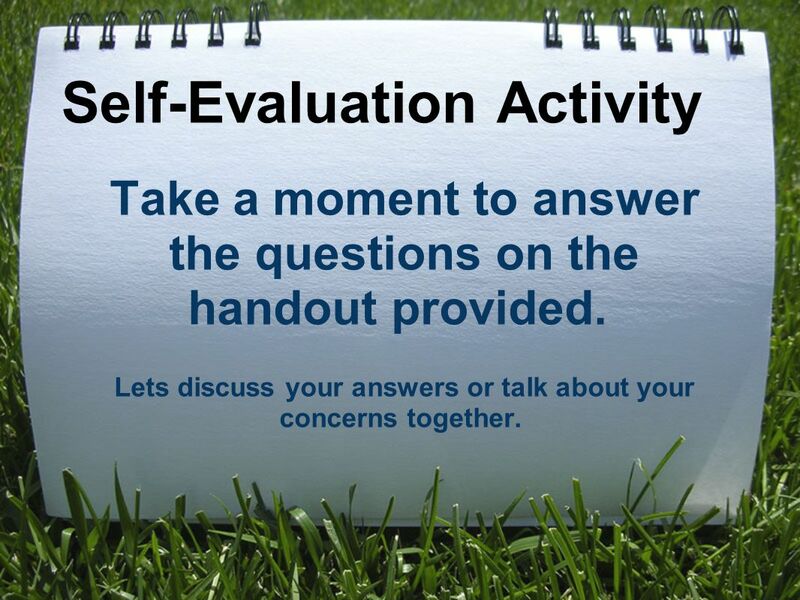 18 Self-Evaluation Activity Take a moment to answer the questions on the handout provided. Lets discuss your answers or talk about your concerns together. 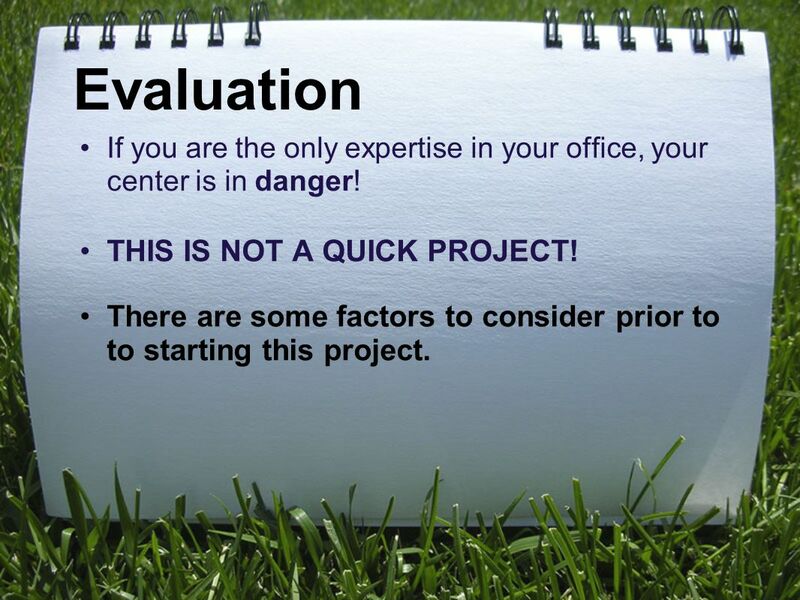 19 Evaluation If you are the only expertise in your office, your center is in danger! THIS IS NOT A QUICK PROJECT! 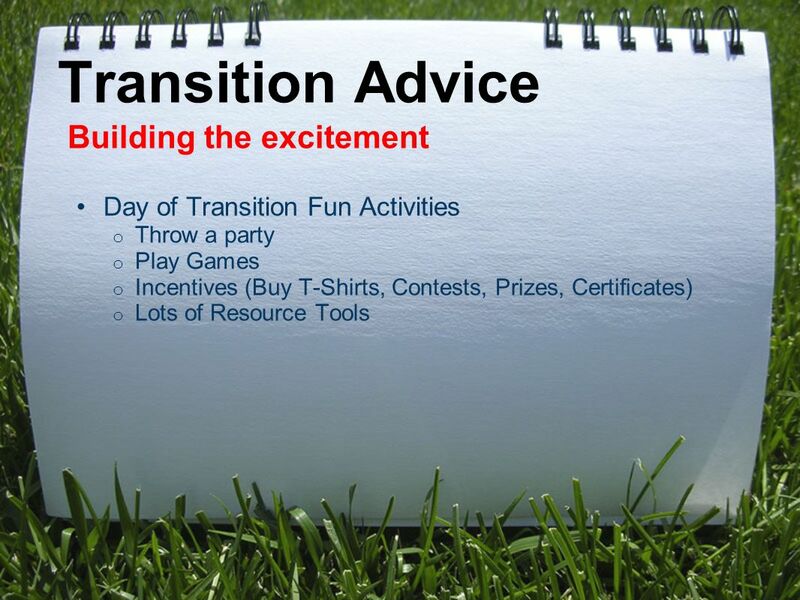 There are some factors to consider prior to to starting this project. 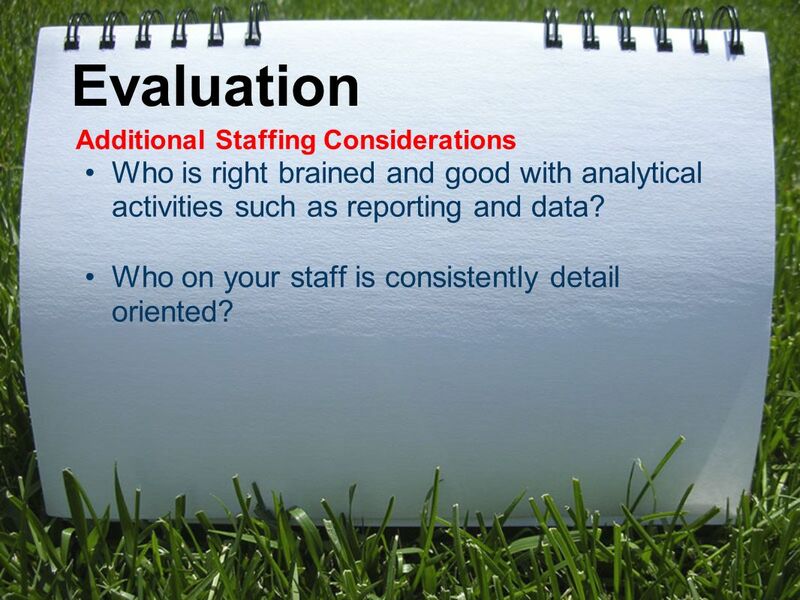 20 Evaluation Additional Staffing Considerations Who is right brained and good with analytical activities such as reporting and data? Who on your staff is consistently detail oriented? 21 Evaluation Additional Staffing Considerations Who on your staff is a good translator between the resource department and the call center? Who on your staff is the keyword expert? 22 Evaluation External Considerations How will you provide the necessary training to individual staff members to increase their taxonomy performance? 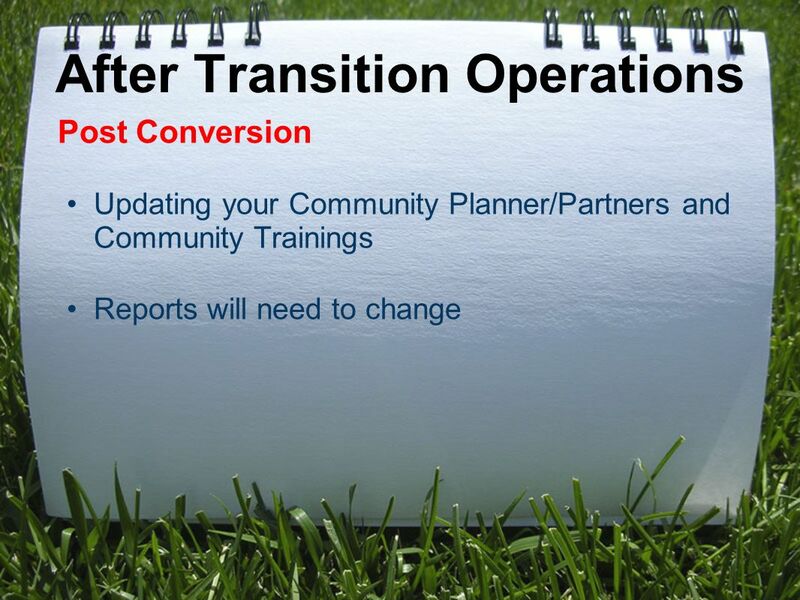 How will you train your community and local community planners/partners regarding taxonomy? 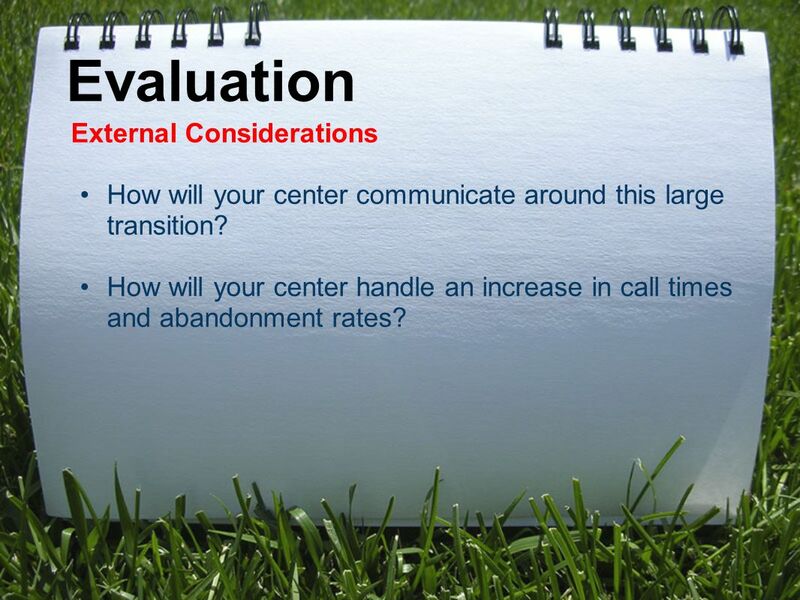 23 Evaluation External Considerations How will your center communicate around this large transition? 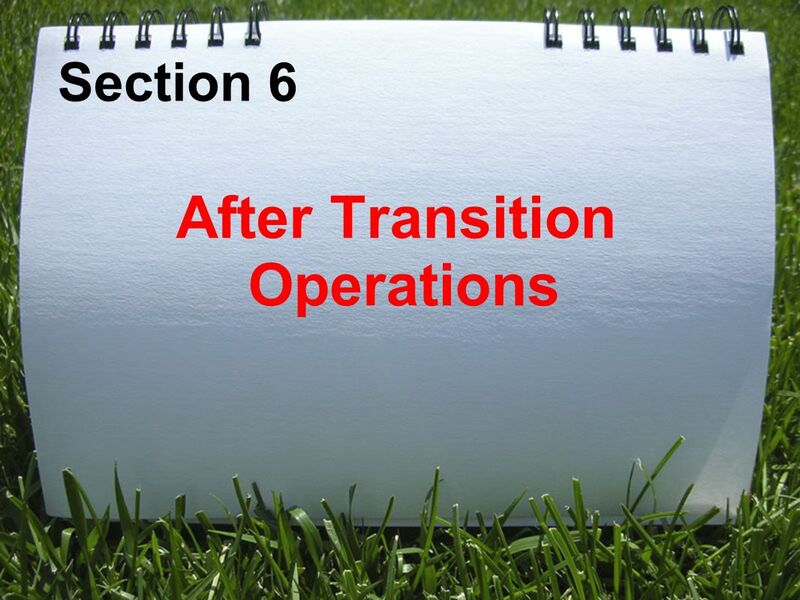 How will your center handle an increase in call times and abandonment rates? 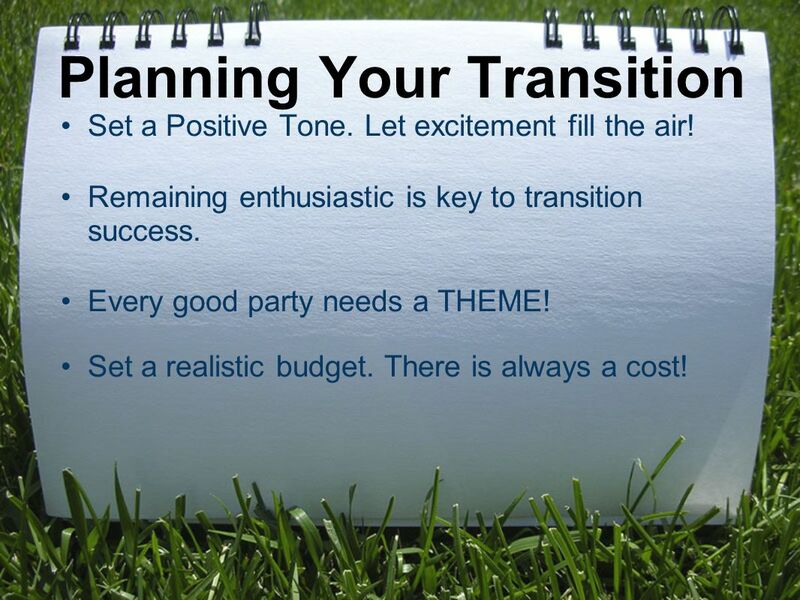 26 Planning Your Transition Set a Positive Tone. Let excitement fill the air! 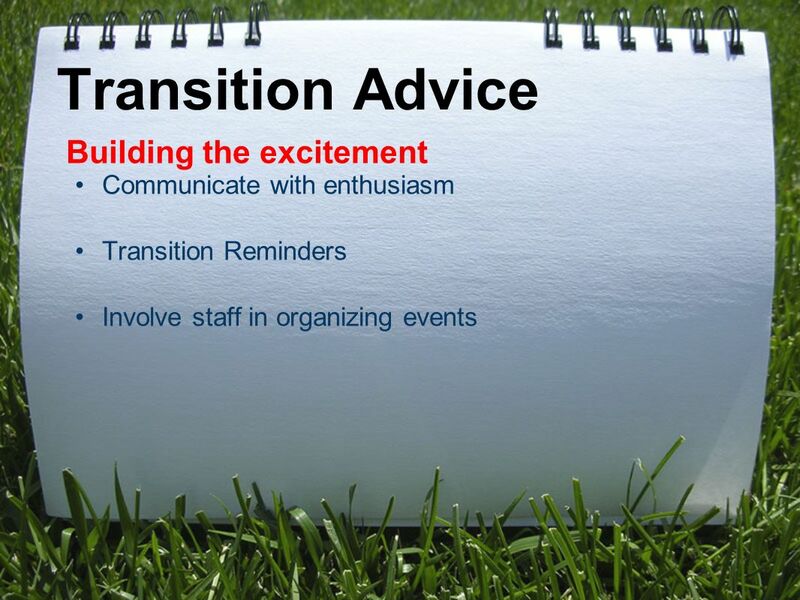 Remaining enthusiastic is key to transition success. Every good party needs a THEME! 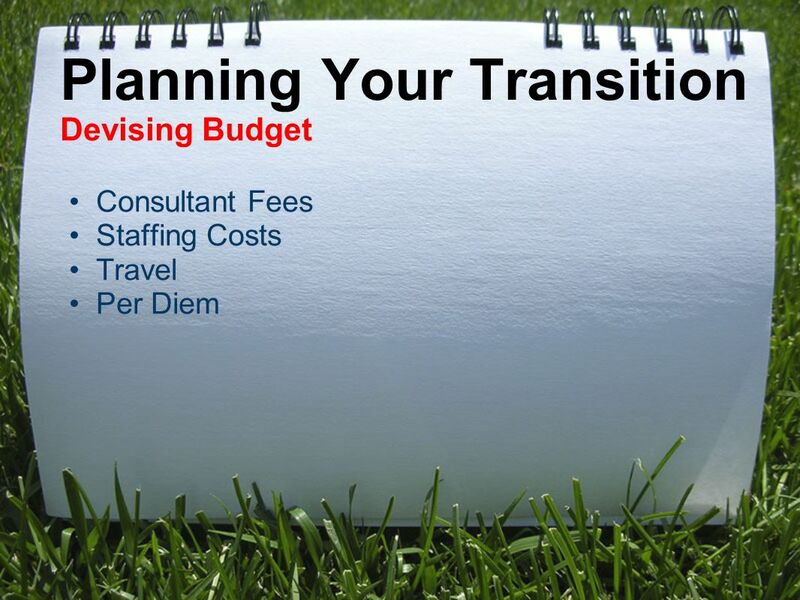 Set a realistic budget. There is always a cost! 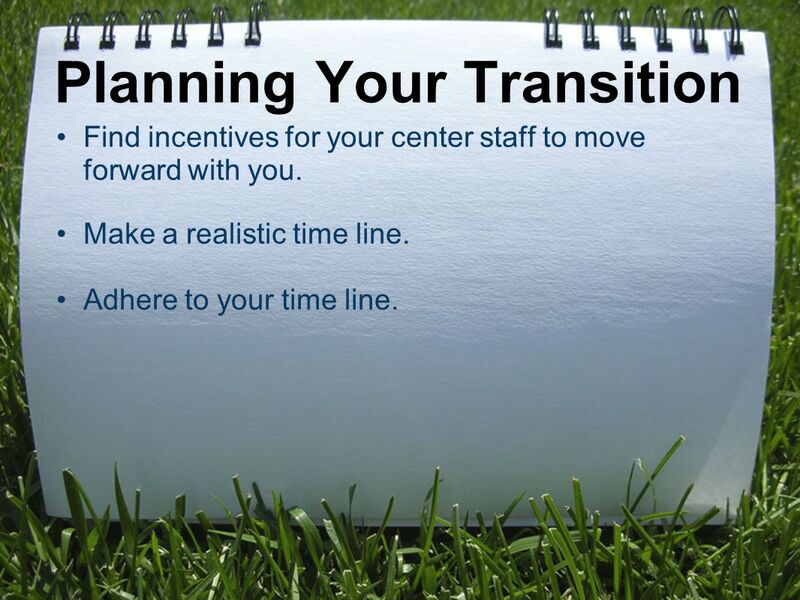 27 Planning Your Transition Find incentives for your center staff to move forward with you. Make a realistic time line. Adhere to your time line. 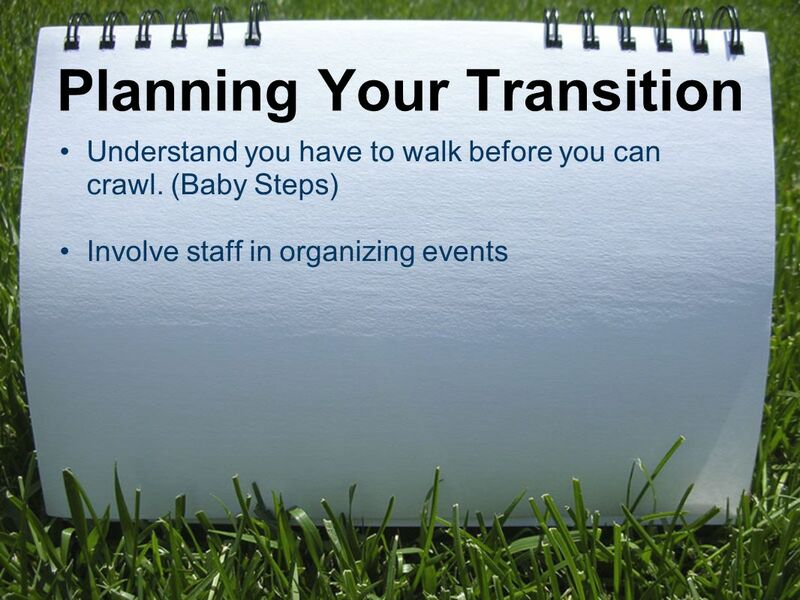 30 Planning Your Transition Schedule frequent and on-going transition check-ups with staff. 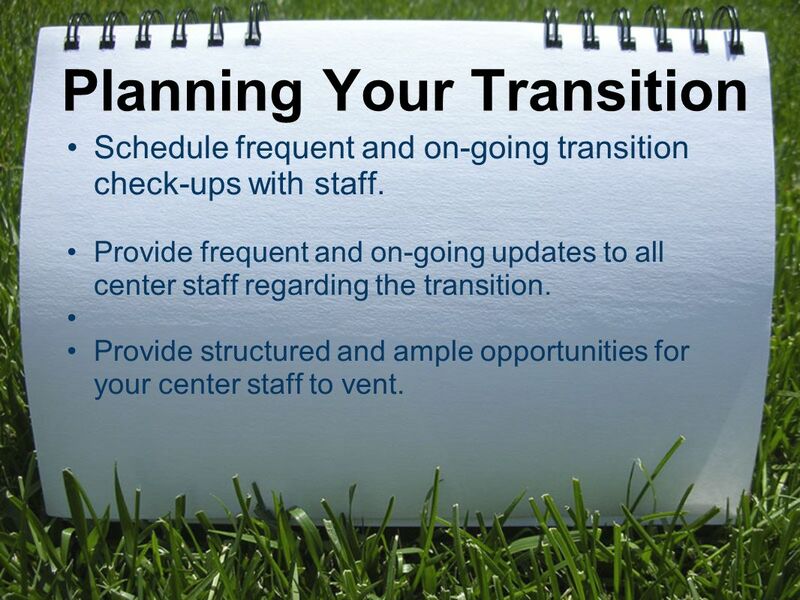 Provide frequent and on-going updates to all center staff regarding the transition. 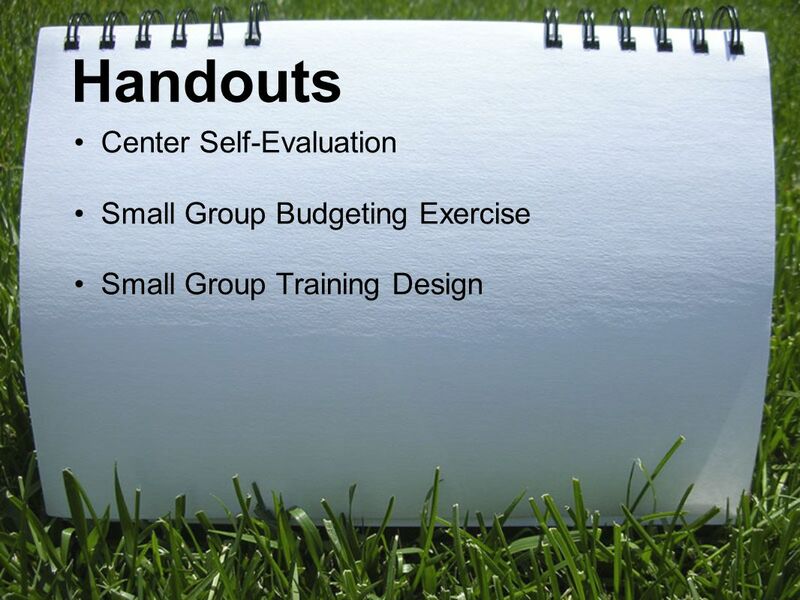 Provide structured and ample opportunities for your center staff to vent. 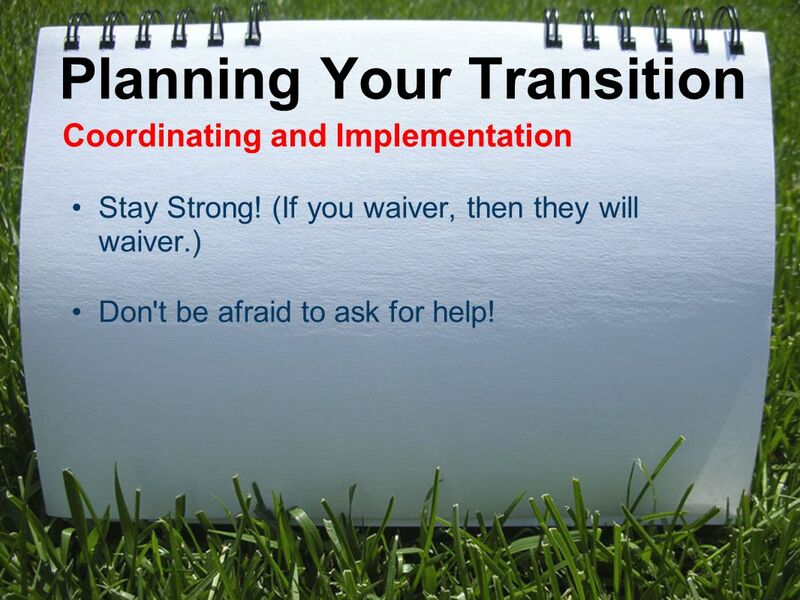 33 Planning Your Transition Coordinating and Implementation Stay Strong! (If you waiver, then they will waiver.) Don't be afraid to ask for help! 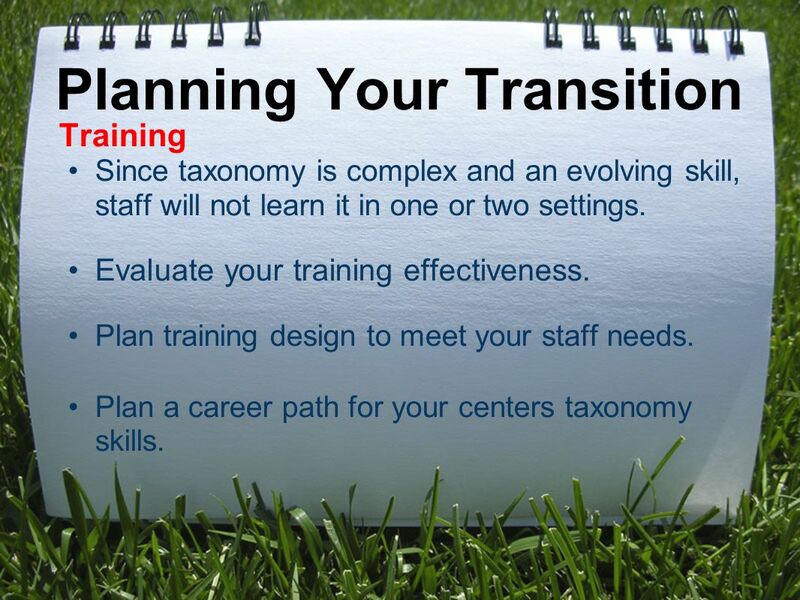 37 Planning Your Transition Training Since taxonomy is complex and an evolving skill, staff will not learn it in one or two settings. 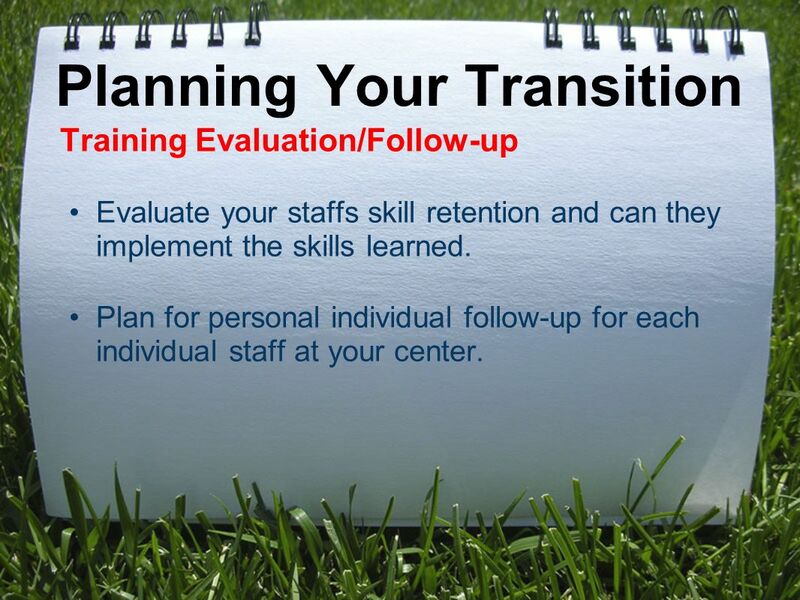 Evaluate your training effectiveness. 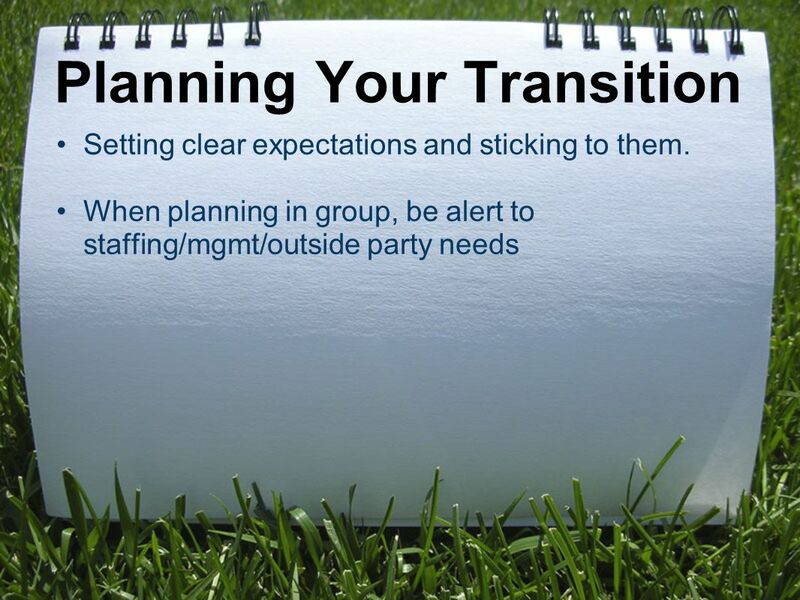 Plan training design to meet your staff needs. 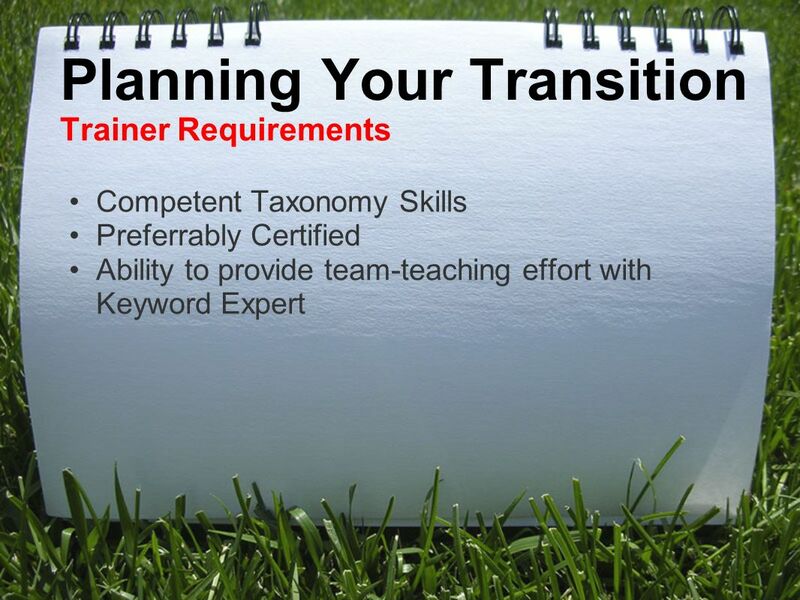 Plan a career path for your centers taxonomy skills. 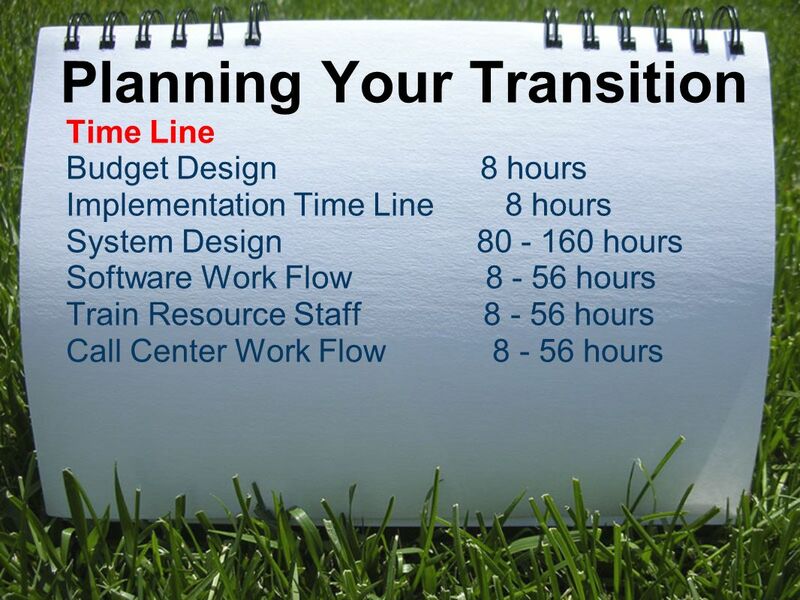 38 Planning Your Transition Training Build in various levels of training for staff. o fosters greater content understanding; o increases chances of skill increase of staff; o increase chance of retention by adult learners. 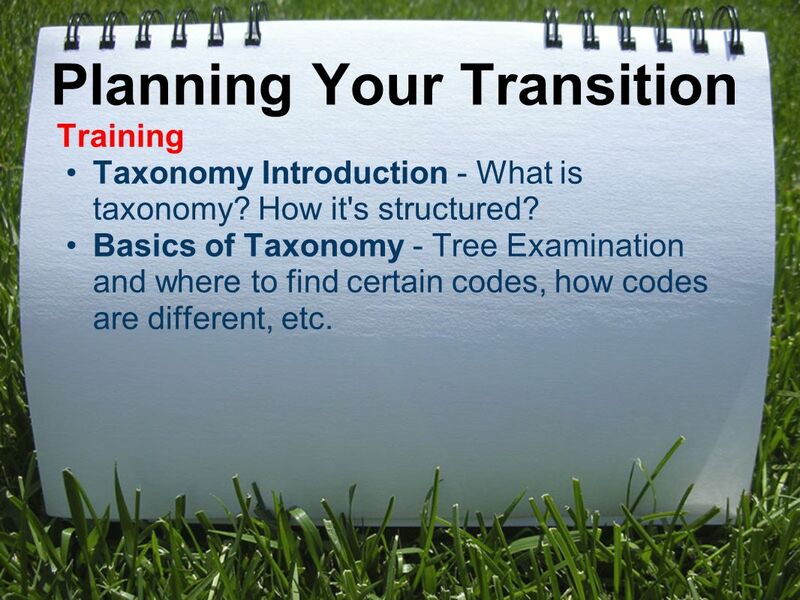 39 Planning Your Transition Training Taxonomy Introduction - What is taxonomy? How it's structured? Basics of Taxonomy - Tree Examination and where to find certain codes, how codes are different, etc. 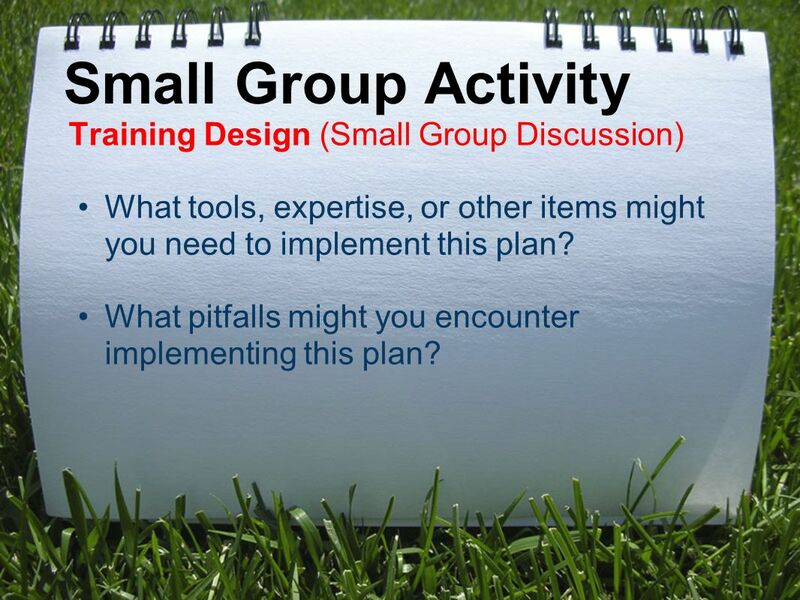 41 Small Group Activity Training Design (Small Group Discussion) What tools, expertise, or other items might you need to implement this plan? What pitfalls might you encounter implementing this plan? 42 Small Group Activity Training Design (Small Group Discussion) How long will it take you to implement this plan? What do you do about staff who do not pick- up the taxonomy easily? 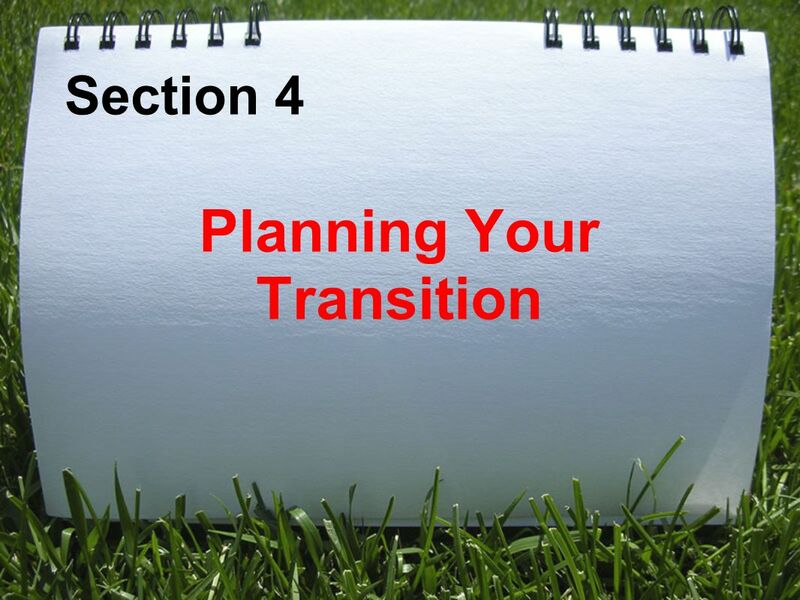 43 Planning Your Transition Training Evaluation/Follow-up Evaluate your staffs skill retention and can they implement the skills learned. 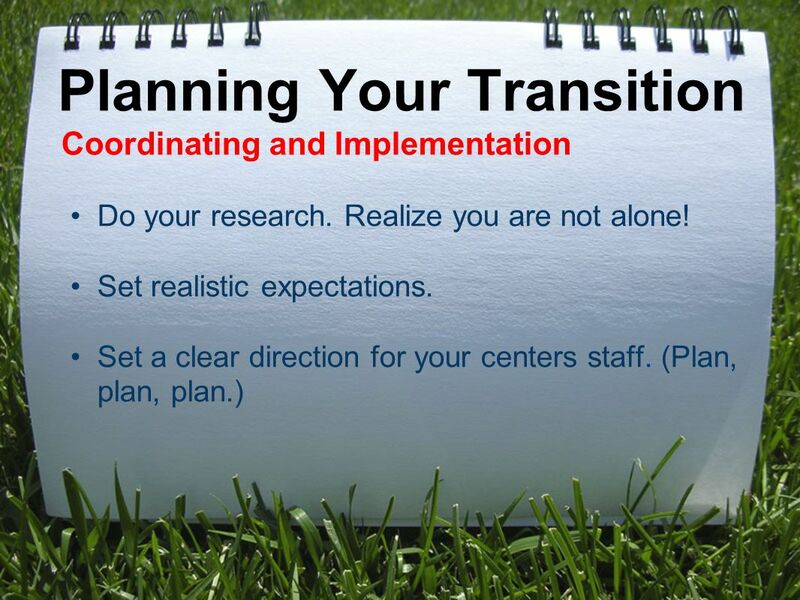 Plan for personal individual follow-up for each individual staff at your center. 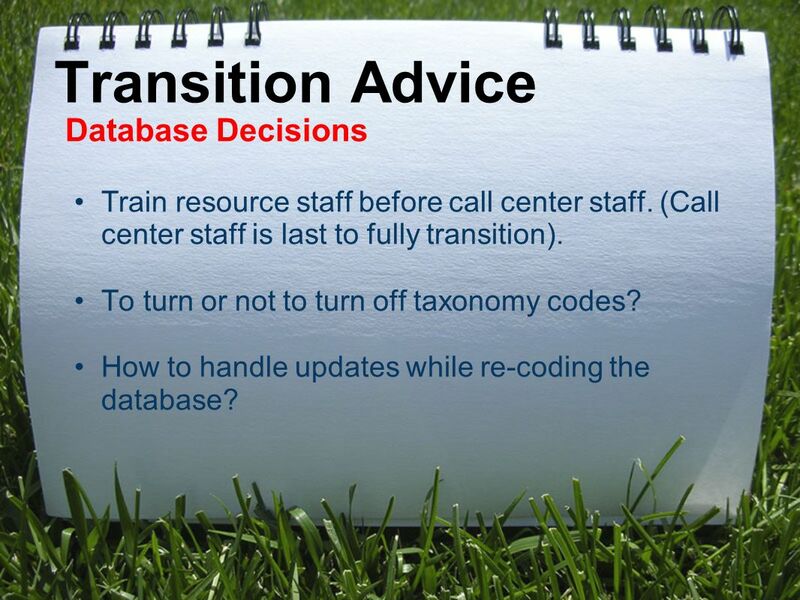 47 Transition Advice Database Decisions Train resource staff before call center staff. 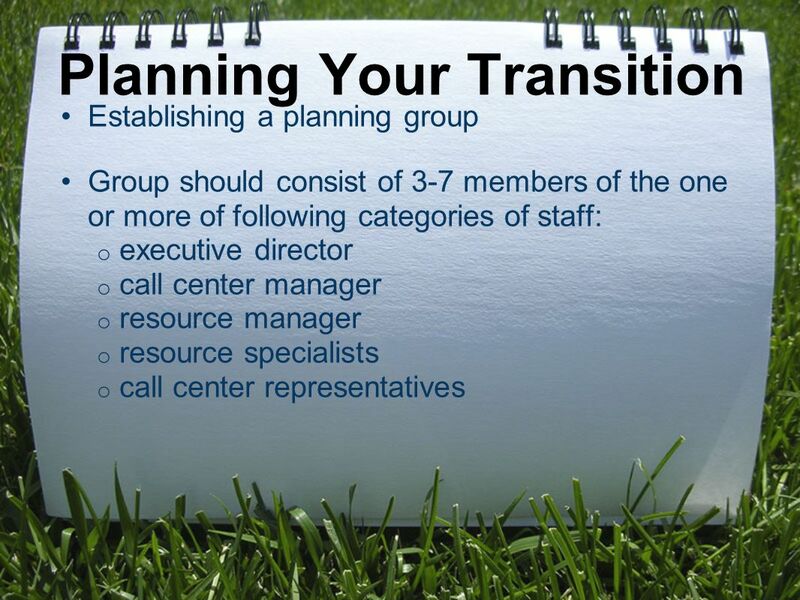 (Call center staff is last to fully transition). 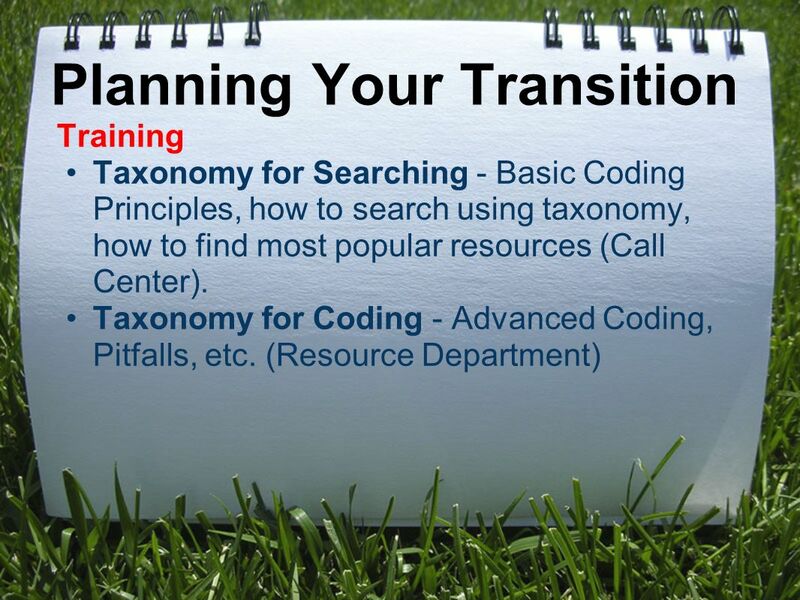 To turn or not to turn off taxonomy codes? How to handle updates while re-coding the database? 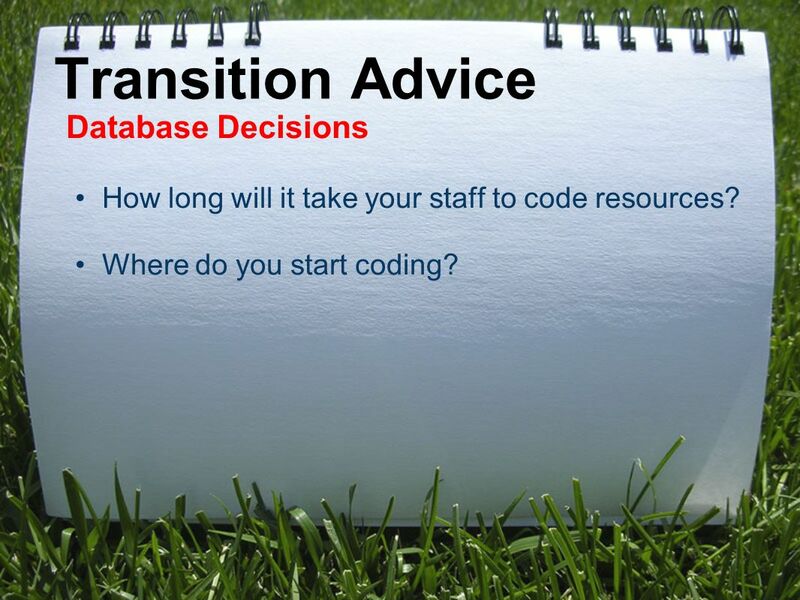 48 Transition Advice Database Decisions How long will it take your staff to code resources? Where do you start coding? 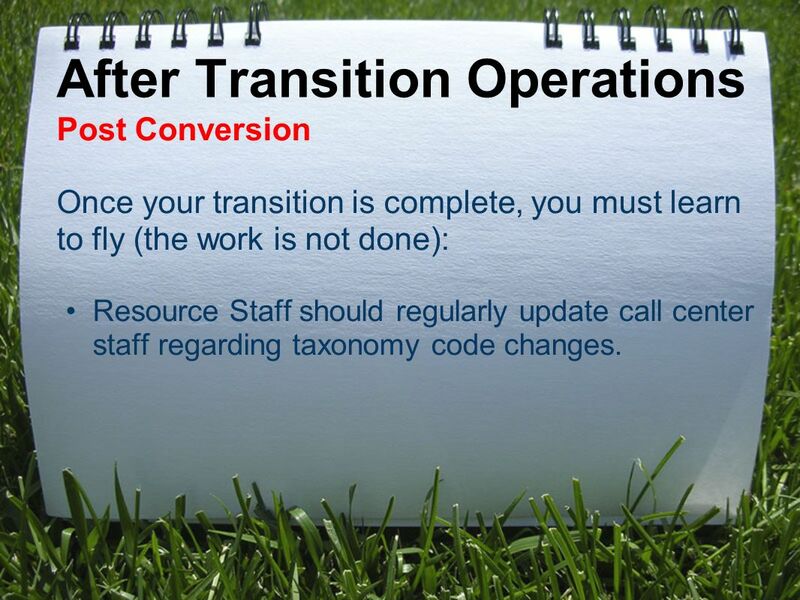 51 After Transition Operations Post Conversion Once your transition is complete, you must learn to fly (the work is not done): Resource Staff should regularly update call center staff regarding taxonomy code changes. 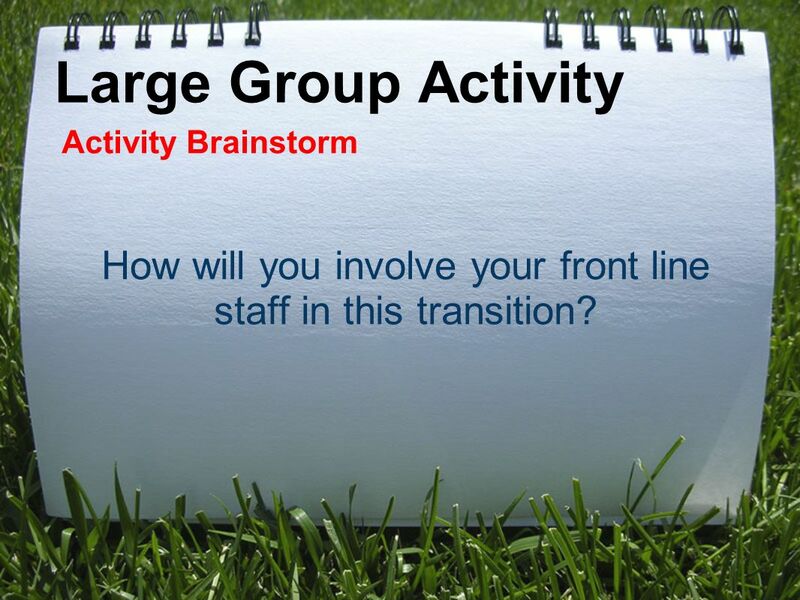 55 Activity Brainstorm How will you involve your front line staff in this transition? 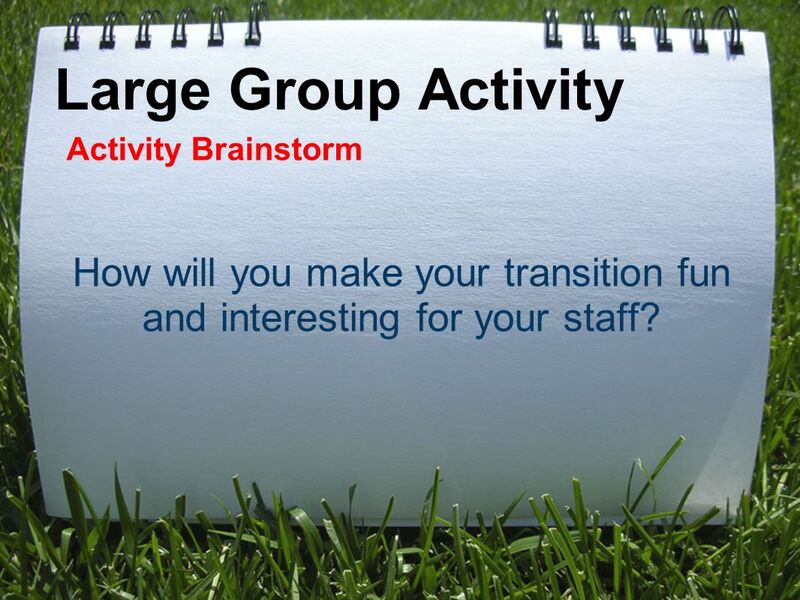 56 Large Group Activity Activity Brainstorm How will you make your transition fun and interesting for your staff? 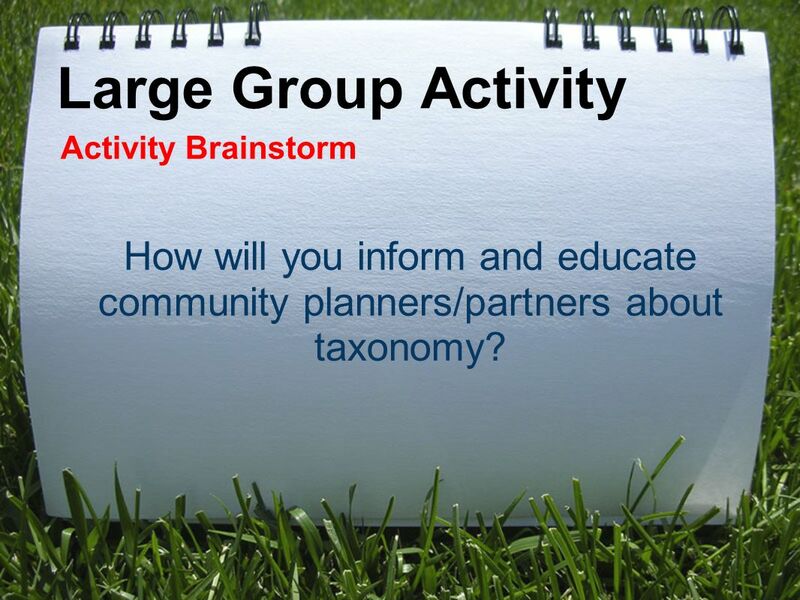 57 Large Group Activity Activity Brainstorm How will you inform and educate community planners/partners about taxonomy? 58 Large Group Activity Activity Brainstorm What is the best method to retrain your local community? 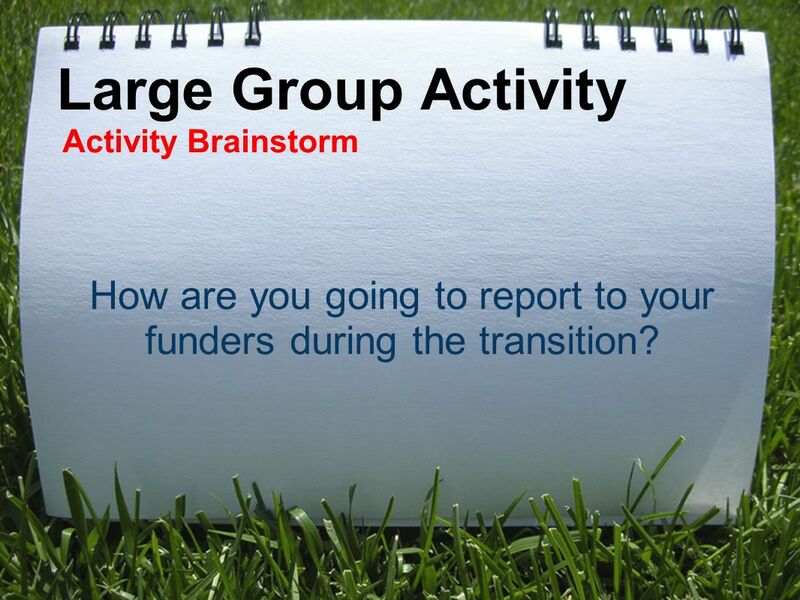 59 Large Group Activity Activity Brainstorm How are you going to report to your funders during the transition? 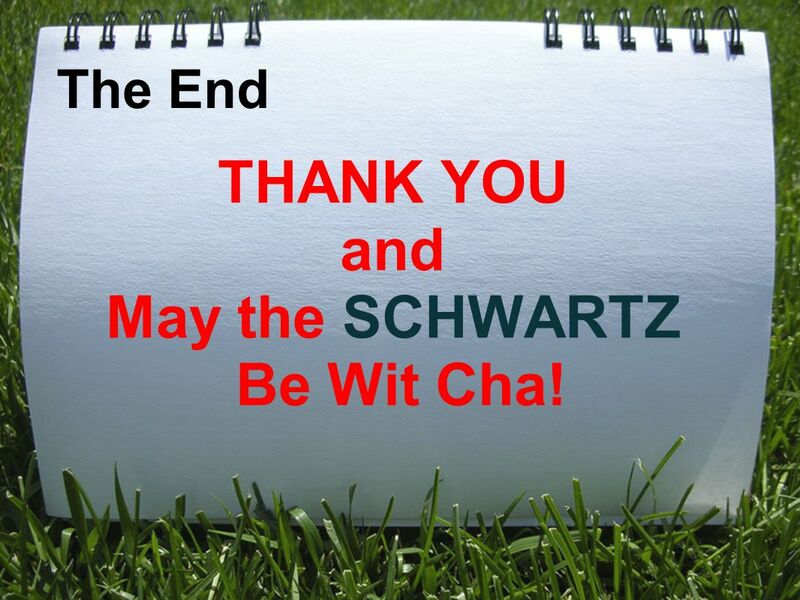 61 The End THANK YOU and May the SCHWARTZ Be Wit Cha! Download ppt "Alliance of Information and Referral Systems (AIRS) 2009 Conference PRESENTATION Transitioning from Keywords to Taxonomy in your Resource Department and." Creating a Resource Specialist Training Manual AIRS Conference June 1, 2009. Global Congress Global Leadership Vision for Project Management. Effective Learning: Lecture 1 Learning Strategies With thanks to David Smith. 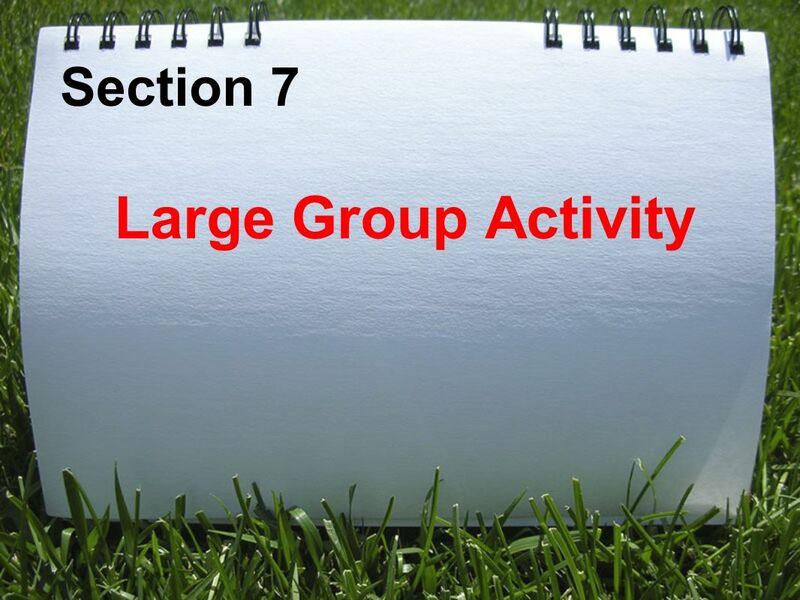 Module 5 Educational and Research Applications 1. 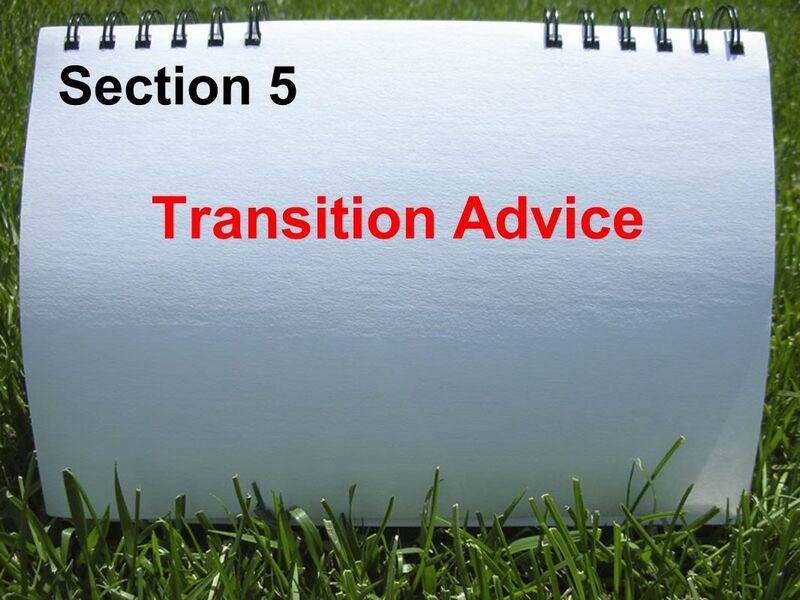 Transitioning with Assistive Technology Presented by Esther Fintushel From Ingham ISD *Originally prepared by Penny Reed and Therese Canfield from WATI. 1 Public Justice Center Baltimore Outreach Services. 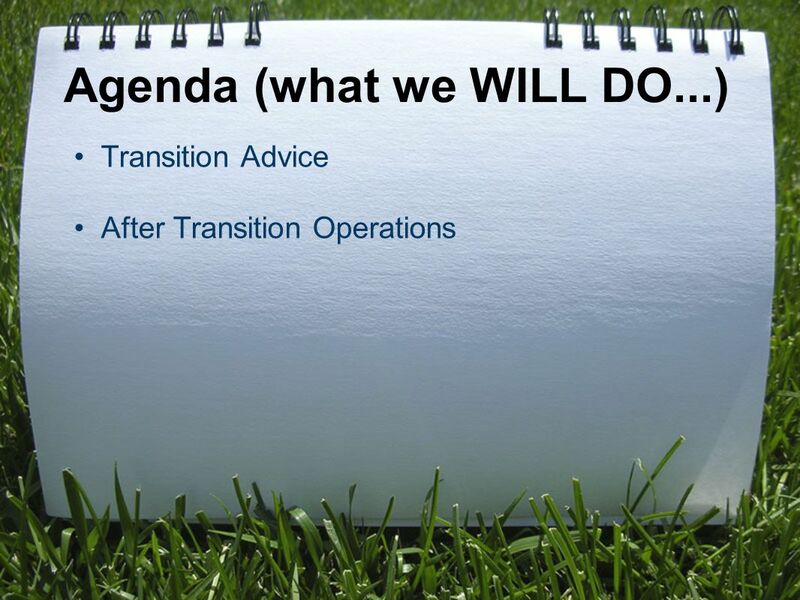 Information leadership VSP Vision, strategy, position. CREATING THE VILLAGE Creating the Village: Strategies for Engaging All Stakeholders in the Educational Process DOE: SCR Brandman: EDDU 9232. Introduction to the Child & Adolescent Needs and Strengths Assessment (CANS) Our Community. Our Kids. Dr. Gary Buff, Ed.D. President and COO. IS550: Software requirements engineering Dr. Azeddine Chikh 4. Validation and management. RED RIVER COLLEGE PLAR/RPL IN ACTION! Recognizing Prior Learning.